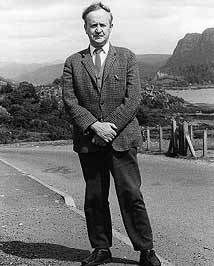 Sorley Maclean (Somhairle MacGill-Eain) was a key force in the revitalising of the Gaelic language. Born in 1911 on the island of Raasay, he studied at the University of Edinburgh, took up teaching as a career, and was for many years head teacher at Plockton High School. His poetry brilliantly demonstrates the capacity of Gaelic to express themes ranging from passionate love to contemporary political and intellectual issues. While he broke with the conventions for Gaelic poetry that still prevailed when he started writing in the 1930s, his writing very much belongs to the eloquent continuum of the Gaelic oral tradition. 'Dain do Eimhir agus Dain Eile' ('Poems to Eimhir') (1943) made innovative use of the modern idiom. Public recognition came much later, beginning to gather pace around 1970, the year Gordon Wright published 'Four Points of a Saltire' – poems from George Campbell Hay, Stuart MacGregor, Willie Neill and Sorley Maclean. A bilingual edition of his 'Collected Poems'> appeared in 1989. Honoured with many major awards, including the Queen's Medal for Poetry, Sorley Maclean was the greatest Gaelic poet of the 20th century.